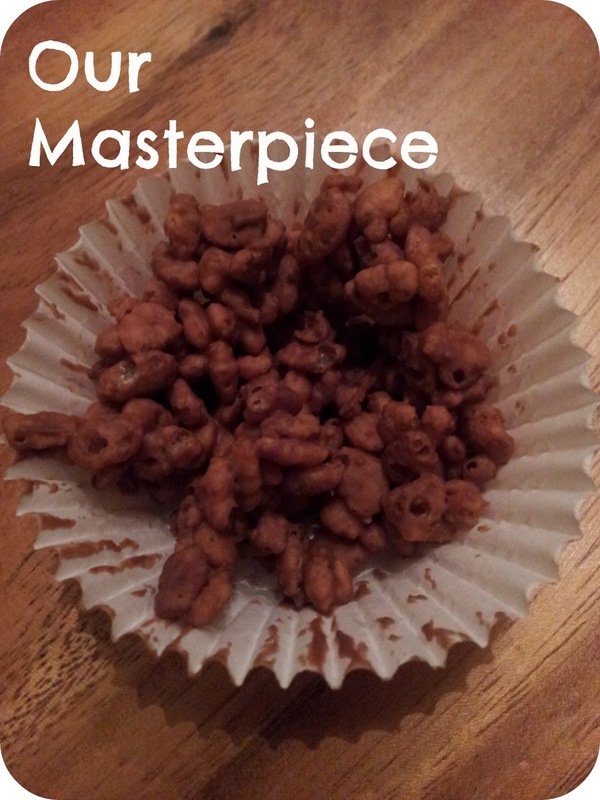 A simple recipe for baking Rice Crispie Cakes with a toddler. Take one seemingly happy toddler, one rather content baby, some uneaten Easter eggs and a box of rice crispies. Strap the toddler in the high chair in the kitchen and pop baby in his bouncer on the kitchen floor. Bring out the chocolate eggs and watch the excited smile take over toddler's face. Help him break up the chocolate into small pieces and watch him smuggle as many of the pieces into his mouth as possible. Suggest that we heat the chocolate in the microwave and watch the confused look take over from the smile. Try and remove the bowl of chocolate pieces from his tight grip - use force if necessary. Attempt to stop total meltdown and distressed cries of 'lock lot egggggggg' as you shut microwave door and fish out tissues for the tears pouring down toddler's face. Put up with sixty seconds of tears and tantrums as the bowl of chocolate is out of his sight and worry that the neighbours will think you are torturing the poor boy. Remove melted chocolate from the microwave and listen to sighs of relief as the tears instantly dry up. Remember that you forgot to wash toddler's hands before you began as they are now immersed in melted chocolate. Check quickly to make sure baby is still alive and content. Pour rice crispies into the bowl and watch the chocolatey fingers explore. Half of these will get eaten in the process so make sure you pour in too many. Grab two wooden spoons and encourage toddler to mix. 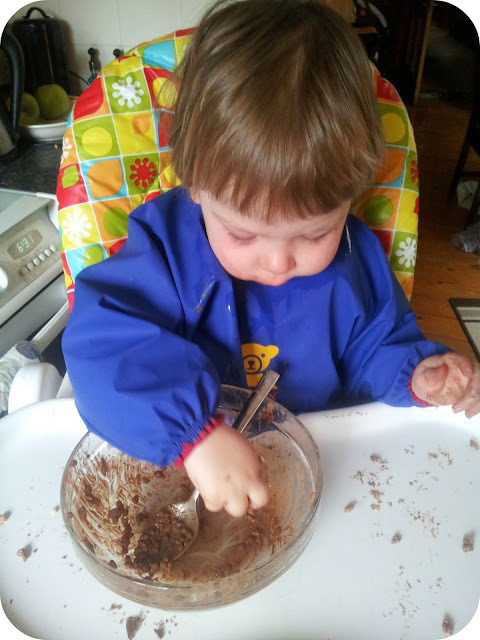 Watch as he uses spoon to flick chocolatey crispie mixture all over previously clean kitchen, bash the glass bowl with it, brush his hair with it and generally do everything other than mix in the cereal. Mix it up yourself trying not to hurt the little hands that are still shovelling chocolatey cereal into mouth at an astonishing rate. When it is all mixed well, bring out the paper cases and show toddler how to fill the cases with mixture. Watch as he attempts to do this with the spoon, his fingers and his mouth. Fill up the paper cases yourself as you really fancy actually eating a cake at the end of the process, and the toddler's are starting to look a little worse for wear. Bribe toddler with a spoon full of chocolatey rice crispies so that you can remove the finished cakes and place them in the fridge. Notice that previously clean kitchen now looks like a cereal packet exploded in it's middle, with some chocolate casualties..
Clean up toddler, let him loose and attempt to save the baby from being fed crunched crispies from the floor by loving older brother. This has made me lol soooo much! Sounds like he had lots of fun!! as long as there was something chocolatey near his mouth he was happy! Lol this was a chuckle to read! I really fancied a cake to eat later - if it wasn't for my determined tummy then I don't think ours would have either! This made me laugh so much !! You sure do know how to make your fans smile. The funny thing is, I can imagine this, perfectly haha.